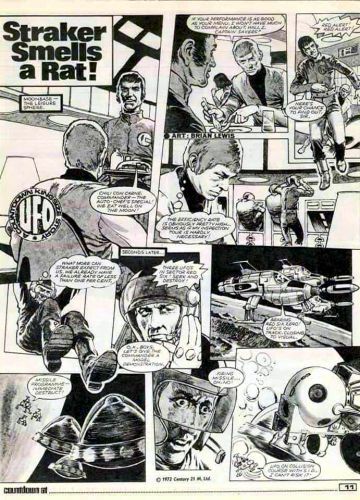 Alec Freeman reports to Straker that recent events have seen UFOs evade SHADO over the Moldavian Alps. Unable to persuade border guards of their mission, Freeman and co-driver Matthews crash through a barrier and enter Moldavia in pursuit of a landing UFO. The delay cause them to lose the UFO, and they are captured by Moldavian military and brought before Karasko. The leader states the Aliens have commited no crimes against his country, unlike Freeman, and the two are released – without their Mobile – back over the border. Straker decides to use his position as ‘film producer’ to take a holiday in Moldavia scouting for locations. At Dvarksberg, last known position of the UFO, Straker meets a local who tells him the legend of ‘evil dwarves who carried off children’, and of a new meaning to this. Straker recognises the pattern of abduction and heads off, but he has attracted the attention of the military. In the mountains, Straker watches a helicopter bring Karasko himself to a cave, where an Alien greets him. Straker steals the helicopter, and uses it to stir up the Moldvian military nearby. They follow when he heads into the cave and hides, leading to a confrontation between army and Aliens. Straker shows the men frozen Moldavians, awaiting transport to the Alien planet, and the military turn on Karasko. The base is destroyed, and the Moldavian major decides perhaps it is time for his country to take its place with the other nations of Earth.